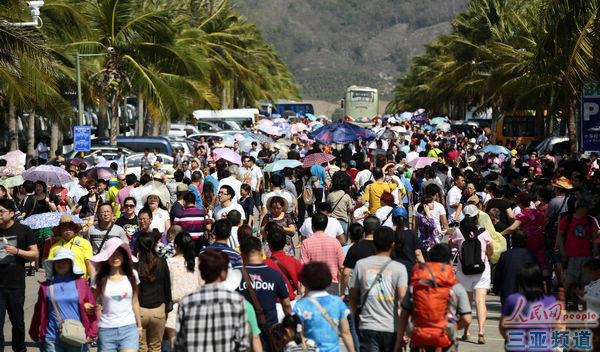 As the holy land for praying, Sanya Nanshan Cultural Tourism Zone has attracted over 130,000 visitors from February 10 to 13, the 1st to 4th day of Chinese New Year. On February 10, the first day of Chinese New Year, Nanshan embraced its first travel peak during the week-long holiday period and received more than 50,000 visitors, the highest daily number of tourists visiting the scenic spots during Spring Festival. On February 11, Nanshan received 35,400 visitors, up 14.56% from the same period of last year. On February 12, the 3rd day of Chinese New Year, Nanshan received 35,000 visitors, up 13.85% from the same period of last year, and 25,000 visitors of them were individual travelers. On February 13, the 4th day of Chinese New Year, Nanshan still received over 30,000 visitors, and most of them were individual travelers and 3400 self-driving cars were parked at parking lots of the scenic spot.